Bird experience is preferred but not necessary. Our adoption process begins when we receive your completed application, which will be reviewed by our Adoptions Coordinator. You will be contacted in order to schedule a visit to the sanctuary. If one of our birds chooses you, several visits to the sanctuary will be scheduled until you are comfortable with each other and establish a bond. 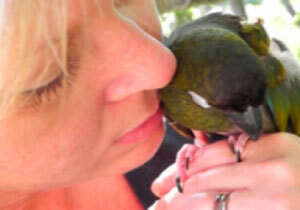 We will discuss cages and educate you as to the requirements for caring for your bird, including a home check. Upon approval, an adoption contract will be signed and hopefully off you will go on an incredible journey with a new friend! 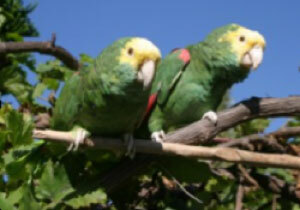 The Lily Sanctuary cares for a variety of parrots seeking a new home. You are invited to browse through the profiles to learn about their species, personality and needs. 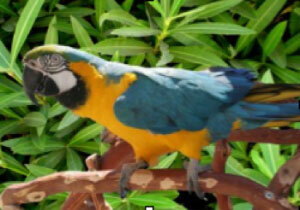 Our facility is designed for medium (African Grey) and large (macaw) parrots. We no longer take in cockatiels, conures, etc. However, there are always exceptions and sometimes we do have other birds. Ready to apply? Please read the information on our adoption web pages so you fully understand the policies and procedures. Next step, fill out adoption application. Each adoption is an amazing story. 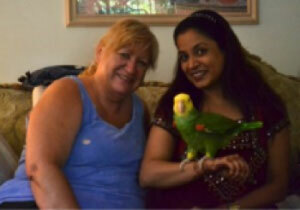 From the moment a parrot and potential adopter meet, the journey they take together is heart warming. Many of our birds come from situations that were challenging for them. We profile adoption stories that are a testimony to the emotional bonding that evolves.